Map of Aston Clinton - Here is a location map for Aston Clinton near Aylesbury in Buckinghamshire UK. Aston Clinton Map: Above you can view a map of Aston Clinton located close to Aylesbury in Buckinghamshire. Visible on this Aston Clinton map are: Aston Clinton Park, Buckland, Green Park Centre, the Oak pub, the Bell, the A41, Shell Garage, London Road, acar2go, Weston Road, Aylesbury Road, Lower Icknield Way, zoom to get Aston Clinton School, Aston Clinton Baptist Church, Buckland Village Hall, Aston Clinton Veterinary Centre, St Michael and All Angels Church, Your Cafe in the Park, China Water Chines Restaurant (formerly Rising Sun pub), Aston Clinton sub-Post Office and more. Use zoom in (+) for more detail. Zoom out for a wider view of the area around Aston Clinton. Click on the small box (bottom right) for a satellite view of Aston Clinton. Above you can see an Aston Clinton street view (Google), showing the London Road as it passes Anthony Hall in the centre of the village. 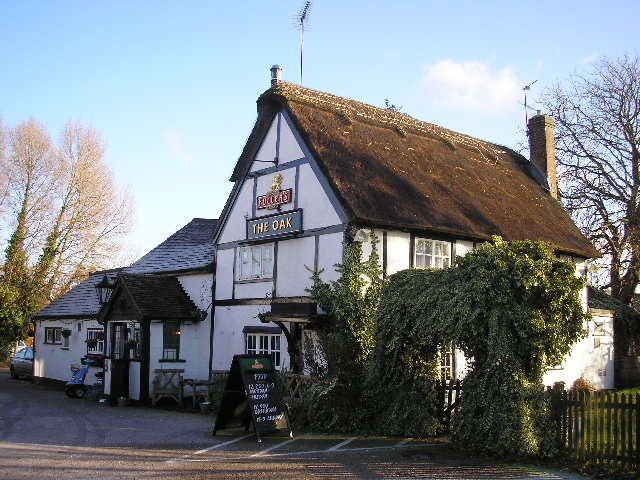 Image of the Oak Aston Clinton.